There are few milestones in adulthood more noteworthy than buying your first home. While many people eagerly anticipate holding the keys to their first home, the road to get there can be intimidating, especially in the modern real estate climate. After the housing fallout over the last decade, some people may have some trepidation about entering the market, especially in areas like San Diego. However, San Diego has shown strong signs of rebounding in recent years, making it a great time to invest in your first home in Southern California. 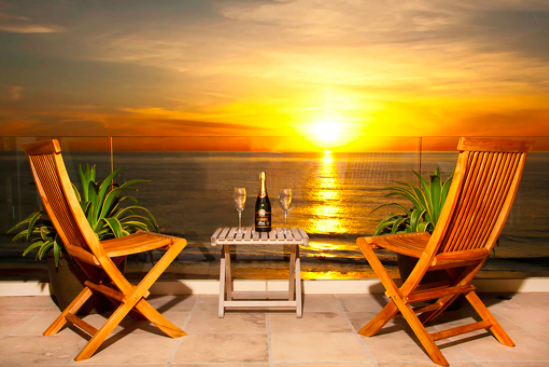 Beachfront La Jolla Home – Sunsets! Courtesy photo © Airbnb, Inc.
To prepare yourself to buy your first home, consider the following tips. 1. Talk to your bank. While it is okay to peruse the listings before you start looking seriously, you should always talk to your bank early. In the aftermath of the housing crisis, lenders have tightened their standards. Therefore, before you set your heart on a new home, you need to get pre-approval, which is an estimate of what amount they are willing to lend you. It is important to keep in mind that the pre-approved amount may still be higher than you are comfortable spending. However, you will not be able to spend more money beyond that, so pre-approval is critical to set your budget. 2. Establish your wish list. Sit down and make a list of the features you really want in a new home. Consider a wide variety of factors, such as location, layout, bedrooms and bathrooms. Maybe you want a pool or fruit trees. Maybe you would like a two story home or ocean views. It can be helpful to rank the items on your wish list. That way you know what items are negotiable and which ones are going to be deal breakers. 3. Find an agent. Real estate agents offer expertise that makes the process easier and less stressful. Agents have insight into the market, which can help determine if a home is overpriced or underpriced. They can also point out potential pitfalls, or they may be able to explain how certain cosmetic concerns can be changed. Real estate agents also know about homes before they are listed, which can give you the edge in a competitive San Diego market. 4. Look at homes. Home shopping is exciting, but it can also get overwhelming and discouraging. If you have a limited budget, you may be disappointed in your options. Very few buyers walk in and instantly know that they have found the one. Try to keep an open mind. Look beyond cosmetic features that can be easily fixed. Focus on the big picture issues, like layout and location. If you look at a lot of homes over a period of time, consider making notes and taking pictures so you remember exactly what you think about each particular home. 5. Make an offer. Once you select a home, you have to make an offer. In some cases, you may be willing to offer the asking price. In other cases, you may want to offer less than the asking price, especially if your realtor indicates that it is overpriced. However, if the home is in a desirable area, you may need to make an offer above the asking price in order to outbid the competition. You can also include other things in your offer, like a home warranty or moving costs. Sellers will be able to counter your offer, so you have to be ready to go back and forth before settling on a final price. 6. Hire a home inspector. While most sellers will provide information about any problems on the property, you will still want a home inspection. A home inspection looks at all the home’s systems, including HVAC, plumbing, appliances, structure and more. While a home inspection cannot catch every problem, it should reveal any major concerns. Once you have a home inspection, you can use that information to make additional requests of the seller. You also have the option to back out of the deal if the home inspection reveals problems that are too demanding. If you are interested in buying your first home in San Diego, be sure to contact me as soon as possible to get started.